Hello May!! As a long-standing tradition here at Camelot Spa, the month of May is the official Mothers Month and we have specials that are tailored specifically for all the mommies. It’s the beginning of yet another month and a brand new season. Spring has finally arrived and that means summer is not very far off. Since it’s spring, we welcome the new season with three pamper options for you to enjoy. 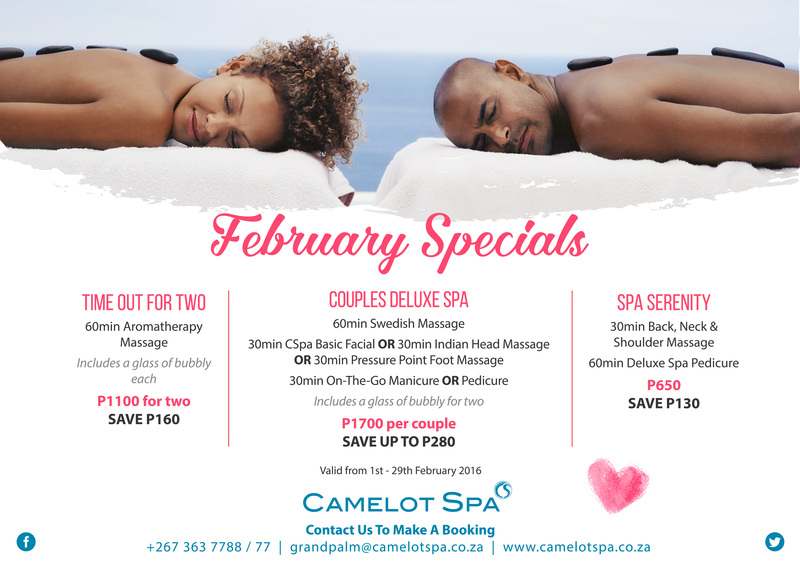 Love is in the air this month and here at Camelot Spa at the Grand Palm are celebrating with some magical pamper options to get you in the mood for love. 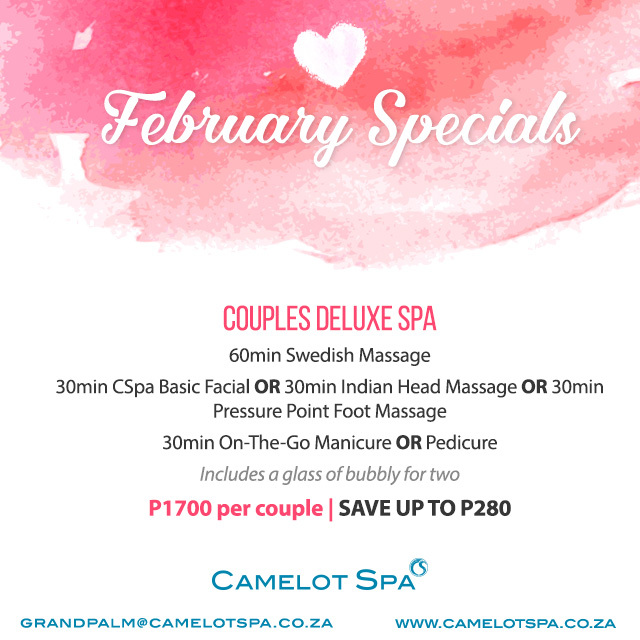 All month long, we offer you three amazing pamper options to help you celebrate love in a unique and meaningful way. We have something for you to enjoy with your significant other and something to either someone you truly love or treat yourself because you deserve it. 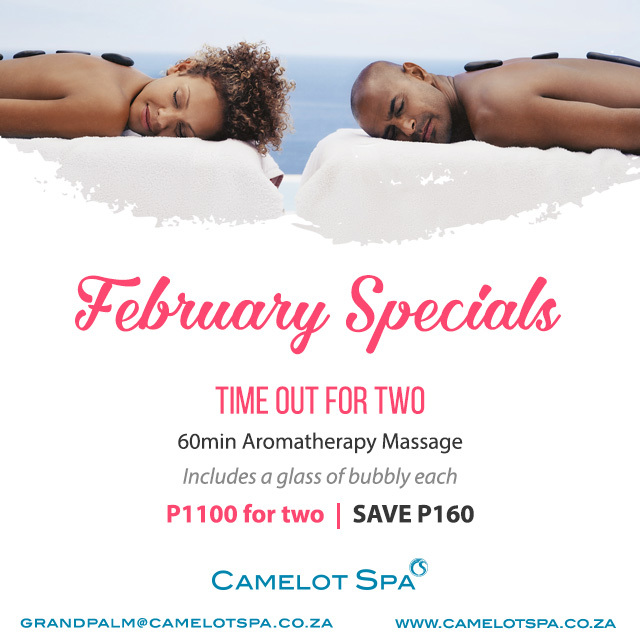 Take some time out this month with your babe and indulge in our #TimeOutForTwo. For the price of BWP 1100, the two of you get enjoy a relaxing 60minute Aromatherapy Massage with a glass of bubbly if you are up to it. If you are looking to do more with him or her, you should definitely try the #CouplesDeluxeSpa. 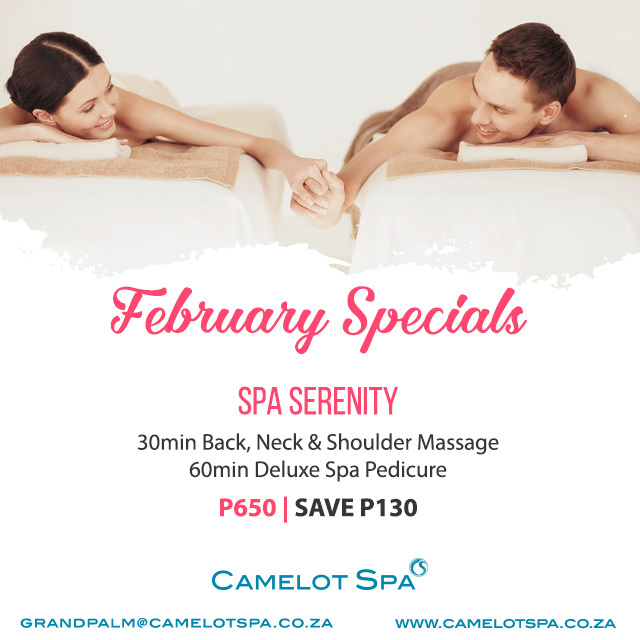 This pamper treat starts with 60minutes of the Swedish Massage followed by 30minutes of either a CSpa Basic Facial, Indian Head Massage or Preassure Point Foot Massage and lastly 30 minutes of either an On-The Go Manicure or Pedicure. This pamper treat is just BWP 1700 per couple and also includes a glass of bubbly for two. To keep up to date with up coming giveaways and competitions throughout the month of love visit our Facebook page like us, follow us of instagram and twitter. We would like to hear from you as well so leave a comment bellow, tweet us, inbox / dm us.